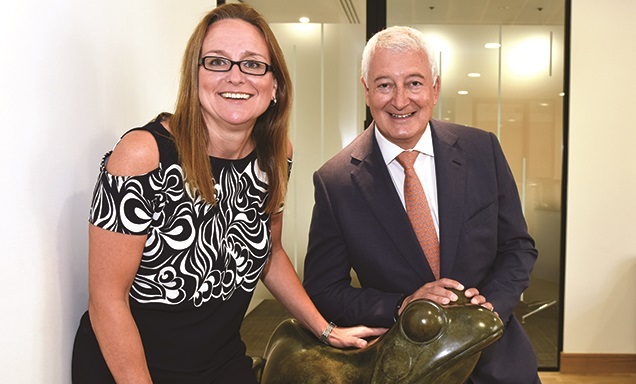 For years, the business was referred to as Paul White’s Frogmore. Not any longer. 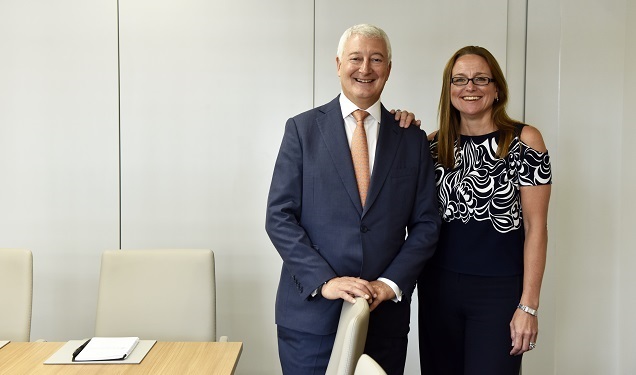 “Jo runs the business now,” says the company’s irrepressible chairman, flanked by his successor as CEO, former COO, Jo Allen. 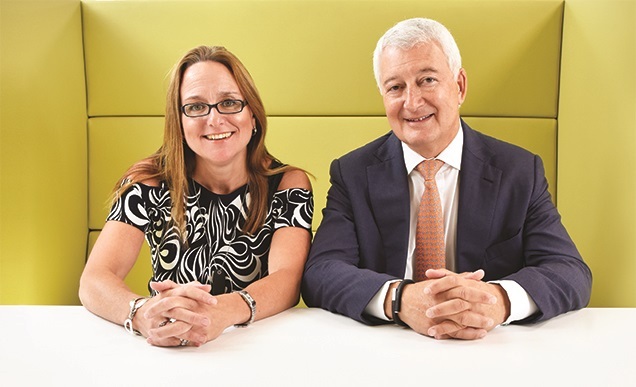 In their first interview together since the changeover, the two talk about Frogmore’s evolution, how they approached the handover this April and where they plan to take the business next. Jo: We’ve been at Frogmore for 20-odd years. I joined in November ‘94 from what was then Richard Ellis. Paul joined in April ‘95 as MD having run his own estate agency business. What was the business like back in ‘95? Paul: When it was a public company, it was very boring, staid and quiet – making £14.5m a year off £250m of shareholders’ funds. The chairman approached me and bought my business. I couldn’t understand how he could imagine I could run a public company. He said: ‘You’re a pied piper, you’re knowledgeable and everyone likes you.’ I turned up in this sleepy outfit, full of nice people. My one shining light was Jo, who told me she wasn’t going to be here very long, so I shouldn’t rely on her. Jo: I thought I can’t stay here but I can’t leave yet because I’ve only been here six months. Paul: Fundamentally, we reshaped the business; 20 out of the 55 staff went and then we went up to 70. From the same financial base of £250m funds, we were suddenly making £55m a year. It was brilliant. Unfortunately the stock market didn’t get that, did it? Paul: They valued us at a discount to NAV. So we decided to take the business private in 2001. We took on massive debt to do it and repaid debt over a few years, shrunk the business down and ended up with a core of 20-odd people. Over time, we realised we were always struggling with not having enough equity, so in 2006 we became a fund manager and raised our first UK fund. Why did you announce Jo as your successor so early? Paul: In 2009, I was 58 and I thought to myself businesses shouldn’t really be run by people in their 60s. They should be run by younger people. So I decided on my 60th birthday in 2011 I would announce who my successor was. I announced it was Jo. That was hugely important for two reasons. One is that if you’re running a business and someone goes under a bus you don’t want the business to collapse and the second is that people always hang on too long. 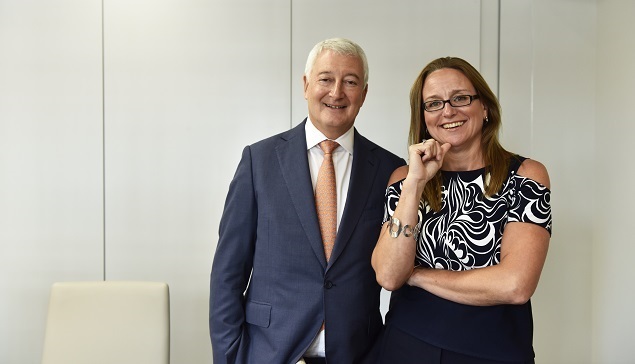 From 2011 to 2016, the plan was that Jo and I would work together as a team so investors would never think it’s Paul White’s fund, they’d think it’s Frogmore, run by Paul and Jo. Paul: I like to think it was expected. She’s a dominant lady in her own right. She’s brilliant. We have a good relationship. We even have the odd holiday together. From a business perspective, no one can get between us. Paul: Unfortunately I had a nasty accident. I was walking with my wife, a car mounted the pavement and wiped us both out. I didn’t work properly for a few months. Jo assumed the role of CEO on a day-to-day basis even though she was COO. We waited until everything was back to normal and then in April, Jo took over. What’s changed since then in terms of your roles? Jo: He’s chairman of the company and chairs the executive committee and also our investment committee. The other main part of his role is deal origination. Thirdly there’s the fund raising. He’s great out on the road and loves travelling. Paul: I like the idea of selling Frogmore. I’ve got my grey-hair experience and contacts and Jo runs the business – that works well and now we’ve got the next generation in charge. Jo: I’ll be 50 next April. I’m running the London marathon for my birthday. That’s my treat. I absolutely detest running so I’m pushing myself on this one. Paul: She’s got 10 to 15 years to do what she wants. If you take over at 57 you’re not going to be able to put your own stamp on it. How would you describe your company’s values? Jo: We talk about property properly. We’re people of integrity and honesty. Frogmore is more than just the two of us – there are 40 of us here. I have a team of very talented people who are very loyal, very highly skilled… we are greater than the sum of our parts. Jo: Our job is to fire holes in the business plan. Paul: I chair the meetings and there are two or three golden rules. One is it’s a positive meeting. The second thing we do is tease out all the issues. Third, no one talks for the sake of it. But at the end, when you’ve finished the meeting, everyone has to have a view personally. How did the transition to fund manager come about? Jo: In 2006, Credit Suisse approached us and asked whether we had thought about capitalising our business with private equity. We got on a plane and went to New York and were fired questions at by very… it was a bit like The Wolf of Wall Street. We were literally aliens in New York but they liked our story, they liked the deals we’d done and they liked our track record. That’s how Fund One started. Paul went to America for five weeks and came back with £330m equity, which we deployed in ‘06 and ‘07. How did Frogmore deal with what happened next? Jo: We didn’t see the global financial crisis coming but we knew something bad was happening, so we wrote to all our investors and said we were going to change the business plan to protecting equity. The story of Fund One is how we stuck in the trenches and used our experience, our ‘plan b’ strategies, renegotiated with banks and turned those assets around. Luckily my background is in asset management.How did your approach to Fund Two differ from that to Fund One? Jo: We raised the money in 2008, £200m in all, and deployed it across 10 assets in ‘08/’09. We were able to take advantage of distress in the market. We went into some slightly different areas: student housing, retirement homes, a data centre in Enfield and some central London residential, which is a market we’d historically been in but didn’t do any of in Fund One. Are there any particular sectors that you favour? Jo: No. We dip in and out of the market. We are stock pickers in response to market circumstances. Our first fund was badged by Credit Suisse as opportunistic, which we realised wasn’t entirely what we do – we are value add. We take broken assets, fix them and sell them to core. Jo: Off the back of Fund One and Two, we were able to raise nearly £400m for Fund Three. To date, we’ve deployed £162m of that across six assets, one of which we’ve just realised – the Millharbour asset. Are you always strategically on the same page? Jo: Fundamentally, yes. I want to correct a perception of Paul that’s wrong. Paul’s a big personality and people think he’s a control freak because he has certain disciplines in his life. He likes to be on time; he likes things as he likes them and that’s fine. People will often say to me that Paul White runs that and you’re a puppet and that is just not true. What we would never do is disagree with each other in front of somebody else. Outside, we can have conversations and we absolutely do not agree on everything, do we? Paul: We agree to differ. Jo: Cultural things. I’m perhaps a bit more liberal with people – more flexible with their working. Paul: In my view, everyone other than a deal doer needs to be at their desk to be working. Jo doesn’t feel the same. But I’m so far away from the coalface… it’d be hard to make a judgement. Jo: We have to build on our track record of these three funds. In time, when we’ve deployed enough of this capital, we’ll be back on the road with our next value-add fund and in the interim we have some other fund ideas and discussions with separate account mandates. We have investors that want to do co-investment. Paul: We haven’t bought anything in 2016 except one little deal for £10m. You probably shouldn’t expect us to do much after the Brexit vote because we’re just cautious people and just assessing where we are. If you’re not targeting specific sectors, what are you looking for? Jo: It’s got to be income producing. We do have some development capability, but we’ll be very discerning with that because it’s limited to 20% of our fund and at any one time only half of that can be speculative. What’s happening with South Place Hotel? Jo: South Place has now completed its third year of trading and we are in the market to sell it. But we’re not a forced seller, so we won’t sell it at a discounted rate. We expect to do a deal in the next 12 months. When are you hoping to get the next fund off the ground? Jo: We have to be 75% invested with this fund first, so I would imagine sometime next year we’ll be out on the road again, wouldn’t you? Paul: My passport is ready. Jo: He’s champing at the bit. I have to be careful – I can’t have him investing in anything just so he can get the tier points. How do you feel about the Brexit vote? Paul: Let’s be clear. Fundamentally, I was not happy with the European Community, but I wasn’t one for throwing the baby out with the bathwater. My reason for voting to remain was simple – good for our staff, good for our company, good for investors, good for everybody. There was no reason to vote out. That said, we voted out, so we have to see what that means. A lot of people say to us that coming out wasn’t as bad as you thought it would be. It’s a ridiculous thing to say. Interest rates are 0.25%. We’re going to be like Japan in a minute; 10 years of nil. Who knows what is going to happen? What impact has it had on your strategy? Paul: We’ll sit on our hands a little bit. We’ll see what’s going on. If a deal comes up that we really fancy, I promise Jo will be going for it quicker than anybody. If on the other hand, nothing does, it won’t surprise us. We’re quick, we’re efficient, we’re successful and we’re poised and ready, but we’re not going to take risks. Jo: The key for me is what’s happening in the occupational market. Because what we buy is usually income, there’s usually a leasing risk somewhere in the business plan, so you’ve got to watch very carefully. That’s why in Fund Two we didn’t buy in any of the traditional sectors. We haven’t got any shopping centres, industrial or offices in Fund Two because the occupational markets had gone off a cliff. I’m really watching to see the deals done in the Thames Valley or in the City – where the occupiers are taking space, because that’s what drives an investment, aside from the cap rates obviously. Will you try to broaden your investor base in Fund Four? Jo: We’ll try to. We’ll do our usual global roadshow and see where the capital is that has an appetite for the UK. It’s a bit like running the Grand National really. First of all you have to find funds that are interested in investing internationally, then ask whether they want to come into Europe and then whether they are happy with a UK-only strategy. Paul: I think what Jo has thought for some time is that the money will come from the East. We have spent the last two or three years going out there on a regular basis – we were recently in Japan, Korea, Malaysia and Singapore. Jo: Three North American pension funds have invested in all three funds and they’re some of the biggest pension funds in the world and I’m very proud of that. I’d expect a more varied investor base going forward and I am very hopeful if we continue our track record that our existing investors will come with us.